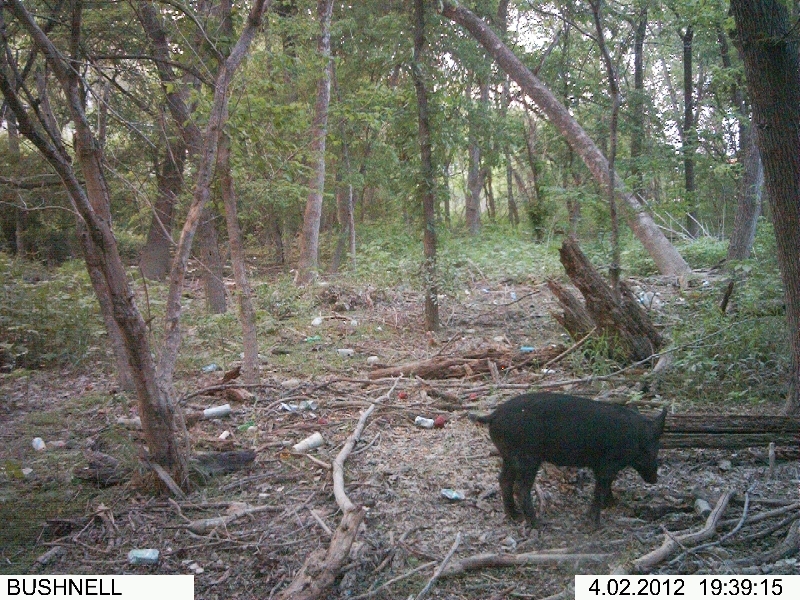 I first photographed a single Feral Hog at this location in the Lake Highlands area of Dallas, Texas several weeks ago. 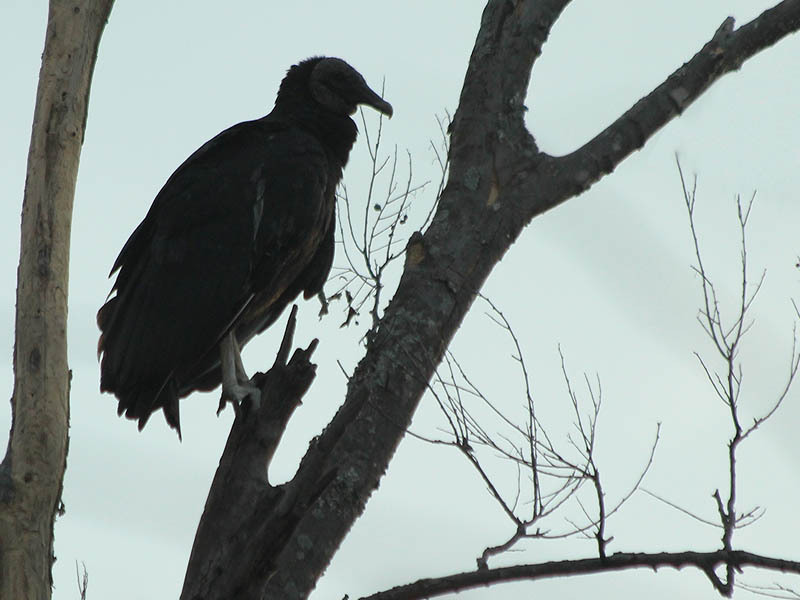 After the initial effort, I continued to monitor the area with Scouting Cameras for the next three weeks. My goal was to get some insight into how many hogs were present in these woods and how they may have gotten here. I retrieved my cameras on April 7, and was pleased to discover that I had recorded around 50 still photographs and over 90 videos, mostly of our friend the pig. Over this entire three week period the same Feral Hog was recorded repeatedly, but no other hogs were seen to be present. This leads me to believe that there is only just the one pig present at this location. Further, this hog appears to be relatively young and female. If true, this represents a very unusual circumstance, as female hog generally congregate into sounders, while males are more likely to wander on their own. There is a known population of Feral Hogs in the Great Trinity Forest about 5 miles south of Lake Highlands, but intervening urban development would make migration from that area very difficult for a pig. Could a wild pig move that distance? Certainly. However, I find it hard to believe that given the degree of development around WR Lake that it would move thru all that north to the island of habitat where the video was shot. Incidentally, it looks to be a female (camera angle makes it hard to be certain) of about 100-125 pounds and likely 10-18 months of age. I went to Google Earth and while there is a considerable chunk of habitat in the immediate area where the video was shot (north of the lake), I did not see any clear or extensive travel corridors leading in any direction away from that area. Therefore, given that it is a single pig, I think you have to at least consider the possibility that it could be a released animal. However, they are becoming increasingly habituated to urban development (they walk the streets in downtown Berlin). Without sightings or damage from rooting in the immediate vicinity of the lake itself that could confirm its trek northward, I doubt that this pig is from the GTF sounder. I’m inclined to agree with Dr. Higginbotham’s assessment. 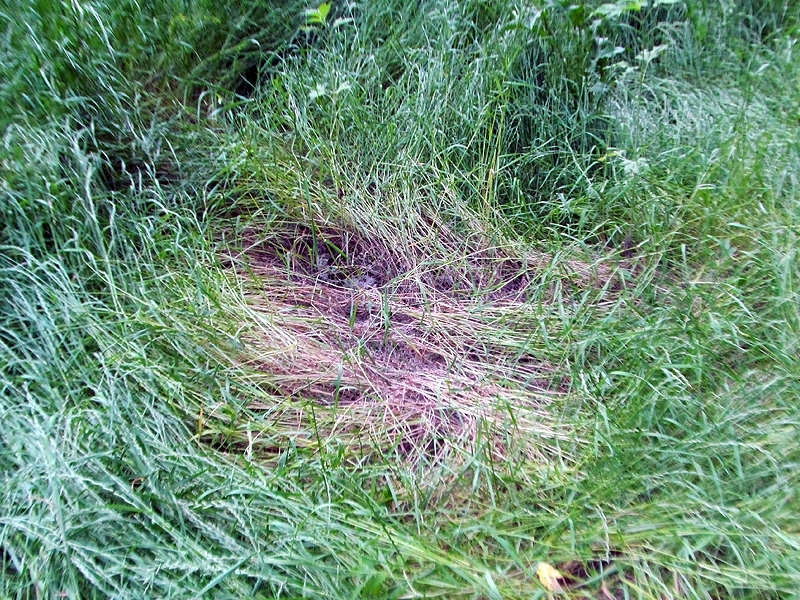 Most likely this hog was released here some time around December 2011 when the first sightings were reported. Released or not, this was still a very interesting observation. 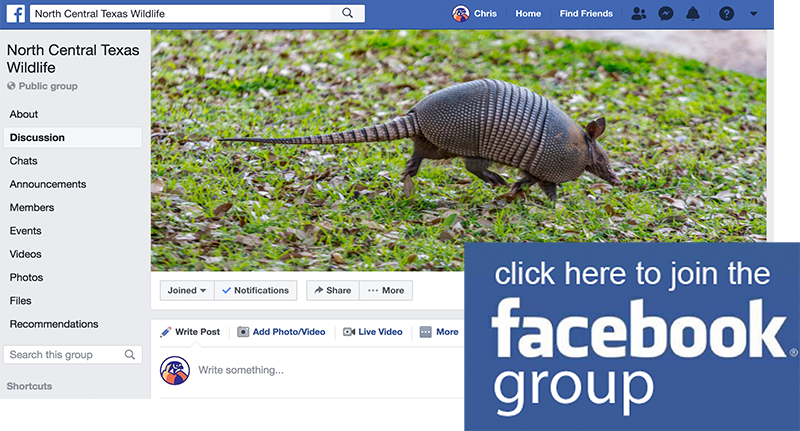 In the pictures and videos below, you will see examples of Feral Hog sign, Feral Hog behavior, and some fascinating recordings of the hog and Raccoons foraging together. Also, be sure to notice the elevated DART (Dallas Area Rapid Transit) rail in the background of the first video. In the last video, a DART train can be seen passing by while the pig continues about her business unconcerned. The hog seems to be doing very well in this excellent habitat. I will check in on her again later in the year. 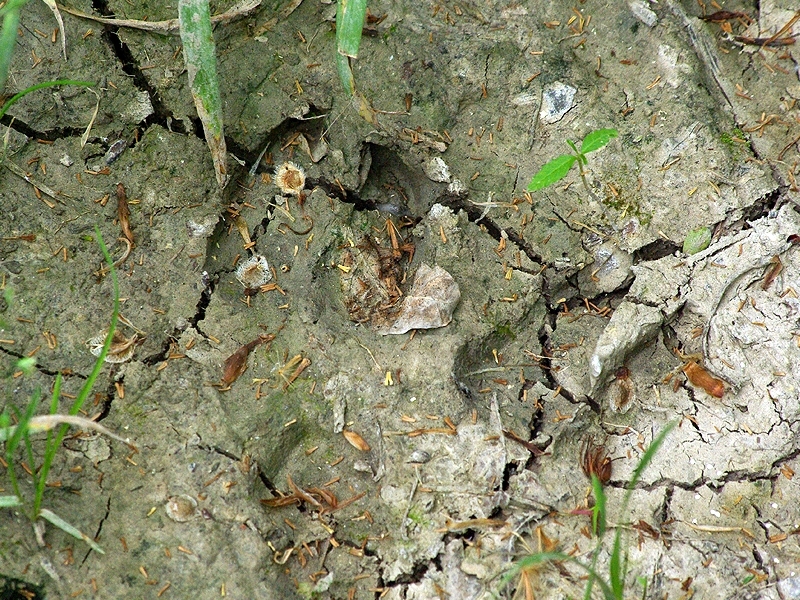 Feral Hog Tracks in the Lake Highlands area of Dallas, Texas. 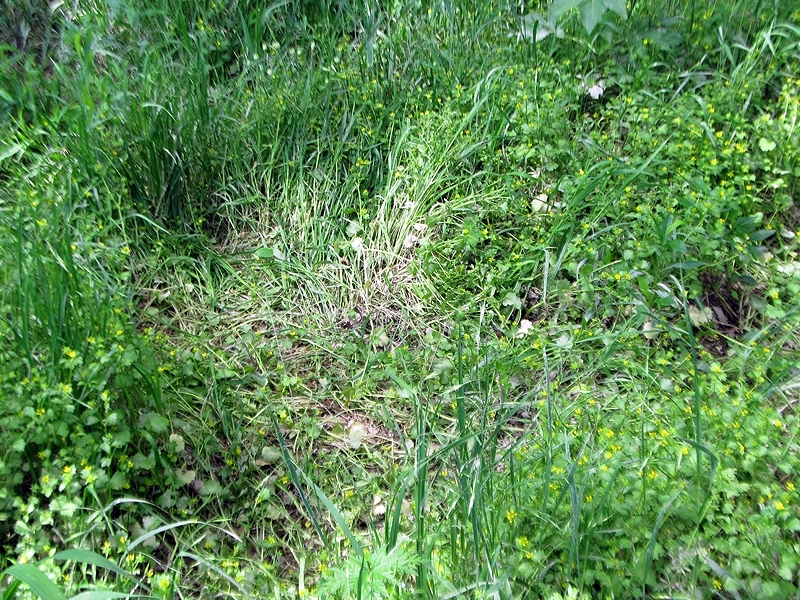 A Feral Hog bed in the Lake Highlands area of Dallas, Texas. 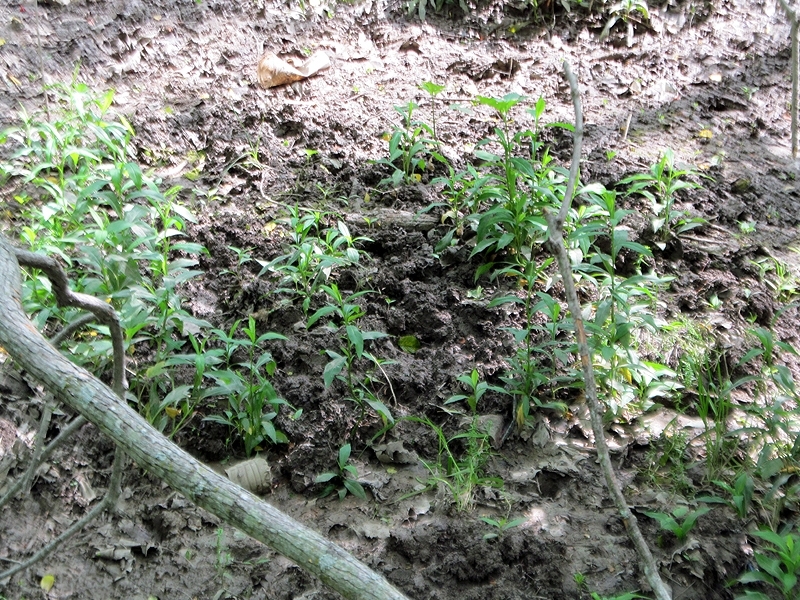 The results of Feral Hog rooting in the Lake Highlands area of Dallas, Texas. Our friend the Lake Highlands Feral Hog. 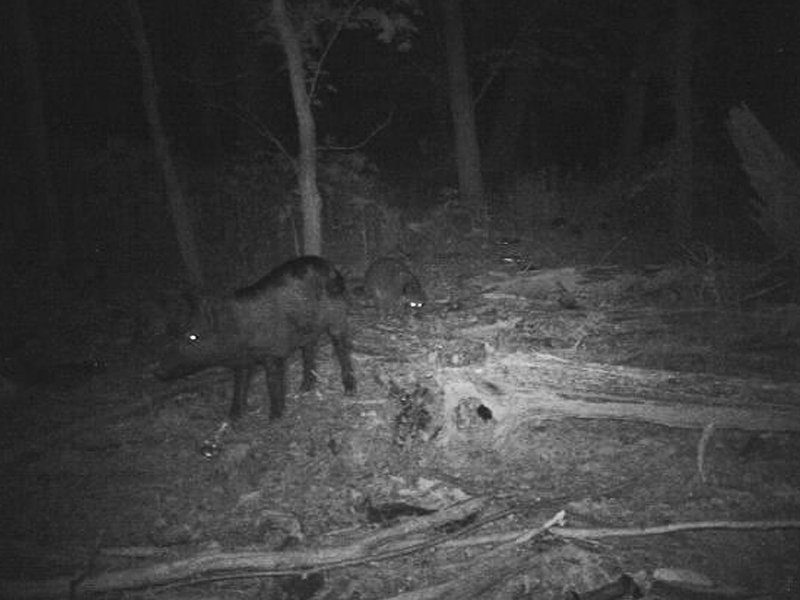 A Feral Hog foraging in the company of Raccoons.